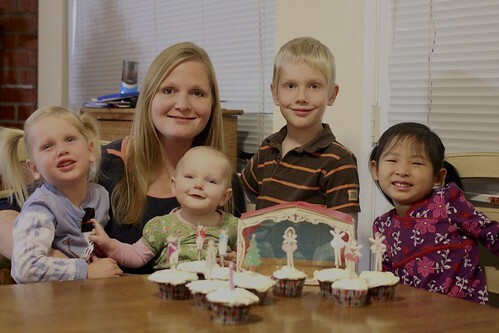 Last year, for Selah’s birthday, I suggested we make a gingerbread cake since her birthday is so close to Christmas. Really, I just wanted gingerbread cake and homemade eggnog ice cream. It was delicious! So this year for my birthday, I decided to forgo the usual deep dark chocolate cake. 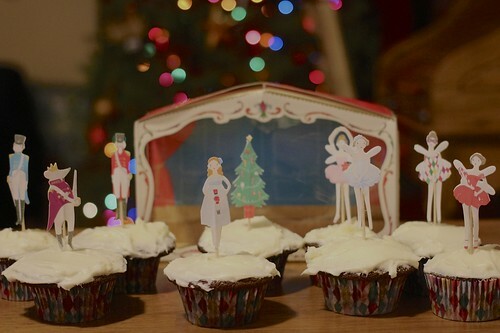 A gingerbread cupcake with cream cheese icing sounded perfect. There are lots of recipes for gingerbread and the one I decided on seemed unusual because it has a 1 tablespoon of chocolate powder in it which could not be tasted. This recipe makes 12 cupcakes which was perfect for us since Selah’s birthday is in 7 days and Schäfer’s birthday is 5 days after that. December is all about birthdays! Preheat the oven to 350 degrees F (175 degrees C). Butter or line with paper liners a 12-cup muffin tin. Cream 5 tablespoons of the butter with the white sugar. Add the molasses and the egg and egg yolk. Sift together the flour, cocoa powder, ginger, cinnamon, allspice, nutmeg and salt. Dissolve the baking soda in the hot milk. Add the flour mixture to the creamed mixture and stir until just combined. Stir in the hot milk mixture. Pour the batter evenly into the prepared tin. Bake at 350 degrees F (175 degrees C) for 20 minutes or until slightly springy to the touch. Allow to cool a few minutes in the pan and remove to a rack to cool. To Make Frosting: Cream the 2 tablespoons butter and the cream cheese together. Beat in the confectioners’ sugar until fluffy. Add the lemon extract and beat. When the cupcakes are cool, frost the tops with the frosting and serve.